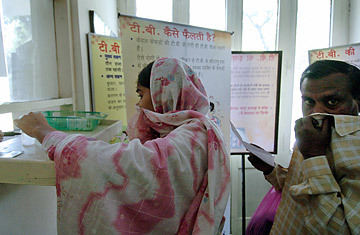 Indian Tuberculosis (TB) patients stand in a queue for sputum collection at a Tuberculosis Treatment Centre in New Delhi. Eighty years after the discovery of penicillin, researchers say they are on the verge of developing a new class of antibiotics. Publishing in the Oct. 17 issue of the journal Cell, scientists at Rutgers University describe a group of antibiotic compounds, first isolated decades ago from naturally occurring antibacterial substances in soil. Among them, researchers say, is a compound called myxopyronin that shows great promise. It has been synthesized in the lab and shown to be safe in animal trials, and although the drug hasn't been tested in humans yet, cell-based experiments suggest that it is potent enough to kill a wide range of stubborn bugs, including drug-resistant strains of tuberculosis and the deadly type of staph known as MRSA. The Rutgers research reflects a much-needed, if slow, renewal of scientific interest in antibiotics development. The last two decades of the 20th century saw nearly zero progress, and in those years several disease-causing bacteria evolved resistance to commonly used drugs. Researchers at the Centers for Disease Control and Prevention found that more than 40% of staph infections in the U.S. in 2006 were MRSA  a bug that now kills more Americans a year than AIDS. Today, the first line of treatment against MRSA is vancomycin, a formidable antibiotic that has been around since the 1950s and is otherwise typically considered a drug of last resort. In the developing world, health workers report a proliferation of XDR (extensively drug-resistant) and MDR (multidrug-resistant) tuberculosis, against which the current first-line antibiotics, rifamycins, developed in the 1960s, have also become useless. "I would say that most of the American public believe that bacterial infections were conquered with the discovery of penicillin and streptomycin and that the dawn of the antibiotic age meant the end of bacterial infection as an important threat," says Richard Ebright, a Howard Hughes Medical Institute investigator at Rutgers and a co-author on the study. What has happened instead, says Zhenkun Ma, head of research at the Global Alliance for TB Drug Development, who was not involved in the new study, is that "we use really old drugs to fight a very new disease. TB evolves every day." So do all other bacteria. Increasingly, the old arsenal of antibiotics is losing power. Ebright hopes myxopyronin will be especially useful in the battle against drug-resistant tuberculosis, a disease for which clinicians have never had a perfect therapy. The success of TB treatment depends on the destruction of active and dormant bacteria to prevent relapse  something that few existing antibiotics have been able to do. One way to kill a dormant cell is to target biochemical processes that continue even in latency  there aren't many of those. But myxopyronin works by interfering with the enzyme RNA polymerase, which controls gene transcription in cells and is necessary for cell survival, dormant or not. Rifamycins, the main drugs currently used to treat tuberculosis, attack the same RNA polymerase target, but at a different site. That means the old drugs and the new drugs "should not have cross-resistance," says Ma. Any new drugs will work against bacteria that have developed resistance to current drugs, but won't interfere with the way the current drugs work. Armed with a new biochemical understanding of how myxopyronin functions, along with detailed models of its behavior inside bacterial cells, researchers say drug development is feasible at last. Ebright says the drug could be in clinical human trials within five years. "What has not been possible previously was design of new derivatives ," says Ebright. "It's now possible to make new derivatives that are expressly designed to...have higher potency."